Best wishes for 2012 from everyone at the Recology AIR Program. Hard to believe it’s already February! January brought the residencies of Donna Anderson Kam, Terry Berlier, and Ethan Estess to a close. We’re sorry to see them leave, but their final exhibition on January 21 and 22 was incredibly successful. Despite heavy rain, hundreds of visitors came out Friday night, and by Saturday the weather cleared up enough for us to put the “free pile” out! Thanks to all of you who attended and supported the artists. We are happy to welcome Beau Buck and Karrie Hovey, who began their residency February 1st. Beau has already met our falconer Indigo Redondo, who uses birds of prey to scare off seagulls at the facility, and acquired some hawk and falcon feathers to incorporate in his artwork. 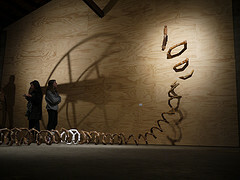 Beau’s sculptural works have connections to folklore and explore what is mysterious or unknown about the animal world. Karrie makes site-specific installations that address global trade, patterns of consumer culture, and the aftermath of consumption through the clever reappropriation of materials. So as you might guess, she is finding ample materials for her work. In late 2011 we were able to expand our studio space for residency artists. The tool and shop area has been enlarged and we have gained several more square feet for the main studio, which becomes our gallery during exhibitions. Those of you who attended Terry and Donna’s exhibition received an impromptu tour of the expanded shop as you walked to the additional room we had access to for the exhibition. We were very grateful to be able to use this room for the show as it enabled Terry’s large-scale sculptures to be exhibited out of the rain and made for a very dramatic installation. Once a month until June we will spend a Friday morning with a San Francisco elementary school here in our classroom making art from salvaged materials. Known as the “Art Lab” these events give kids free rein to make whatever they want from the materials provided, while also demonstrating that you don’t have to purchase supplies to make art—there are many materials around us that can be transformed with a little creativity. The Pacific Northwest Art Program has a new name! Now known as GLEAN, this Portland-based program is in its second year and has been developed collaboratively by Recology; Cracked Pots, Inc., an environmental arts organization; and Metro, the regional government for the Portland metropolitan area. Sixty applications were received by the January 31 deadline for this year’s residencies. The five residency recipients will be announced in mid-February. We are very excited about the fabulous, large-scale installation former artist-in-residence Barbara Holmes has completed at 1045 Mission Street. This is the second exhibition we’ve programmed at the space and the first original, site-specific installation. 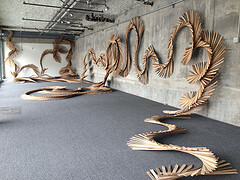 Barbara has used the entire one-hundred-foot length of the room for her piece that is constructed from lath salvaged from the dump. The installation is viewable in the storefront windows 24-hours a day and a reception for the artist will be held Friday, March 23 from 5-8pm. We also have artwork on exhibition in the University of San Francisco Gleeson Library (http://www.usfca.edu/library) through May, and continue our rotating exhibitions in the Chronicle Building Café at 100 5th Street in collaboration with Intersection for the Arts. Environmental protection is a hot issue in resent years.